The game is on! We have spent the last six months dipping our toes in the water of house hunting - meetings with mortage lenders, dinners with realtors, open houses and lots of MLS listings. While we have not found that perfect house just yet, I have been amazed at what I have discovered about myself and the house buying process. The good news is we are not in a position where we have to buy so we can take our time. As renters, the flexibility of when we move is ours and we don't have a condo of our own we have to turn over in the meantime. - Uh, yeah - that monthly housing payment is going to increase. When people say "you can get a mortgage for less than you are paying for rent" they are not factoring in taxes, insurance or assessments. Glad I know that now. - A 2 bedroom is what we need now, a 3 bedroom is what we'll need later. So why not invest a little more now as opposed to outgrowing a place in just a few years. 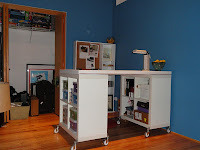 Plus, the prospect of a craft room until the extra space is needed is all to tempting. - New construction is great, but Vintage aint too bad either. I thought I hated Vintage. No matter what, the floors always looked dirty, the floorplans have small, closed off rooms, and don't even get me started on the metal spiral staircases that you will find in duplexes (I can't believe I didn't kill myself on that staircase at Bob's old house!). Lo and behold, one of the places we are enamored with is Vintage to the core, but with modern updates to the kitchen and beautifully kept up woodwork that blends new with old. Plus, if I saw one more cookie cutter new construction 2 bed, 2 bath I was about to lose all hope. - I'm ready to DIY, but not in a major way. Both my budget and my available time screamed "no way" when we saw some real fixer-uppers. However, the appeal of not going new construction comes in when we see potential with a tiled backsplash or outdated bathroom overhaul. One place we are keeping an eye on had unfinished closets - dreams of elfa or California Closets dance in my head. So here's to a few more months of searching and saving, hopefully ending with a signature on the dotted line! Our card display on our hallway wall once again has transformed based on the time of year. Now, our $10 card display rod from Pier 1 is going the extra mile by offering us a look ahead to spring! We got teased with it last week and then suddenly we found ourselves with another chilly night and frosty morning! Definitely ready for this to be over. . .
You might remember some of these cards and tags from a marathon Easter card making session my Aunt and I had last year. Some of the florals from the Valentine's Day spread were allowed to stay, the rest of the display filled in with sweet flowers and whimsical colors. I even found a french postcard in the files that screams "April Showers!" Each weekend I'm taking on one area of the house to purge - and I'm finding myself running out of areas! This past Saturday I hunkered down in the guest bedroom/office to go through my file cabinet. Already fairly organized with file folders, I will admit I have taken to throwing unopened bank statement envelopes and out of order pay stubs in the drawer willy nilly over the past year. Going through every piece of paper was tedious, but also a trip down memory lane. However, do I need to keep 15 copies of my 2004 fresh-out-of-college resume? No. Do I need a completely out of date contact list from my first days on the job back in '05? I don't think so. And so, the shred/toss pile grew. Some of these papers are as simple as the last page of my bank statement that doesn't contain any actual data, just legalese. 3 hours later, the file cabinet was back to organized and was a much lighter load. A few new folders were added including - most important - "Cats." I also realized that alot of my hard copies of statements for phone and bank end in 2009 - switched to almost all paperless in the last couple years! Sonny definitely had fun messing up the pile of paper to shred or sitting on the exact folder I was working through at that moment. On a completely unrelated note, I'd like to share a photo of something else Sonny enjoys sitting on: his brother. . .poor Fredo! It's coming up quickly - our planned trip to Egypt (and Italy) is still on! After much deliberation (some publicly, like in this post), we decided to stick with our trip. Now comes the fun part: getting about 500 things done in the short time before we leave! One item we checked off the list this past weekend was a "packing dry run". The reason for the dry run was to determine if we were going to need to buy another suitcase. I have a large one and a carry on size, and unfortunately Bob's large suitcase recently broke - zippers just won't close among other things! If we could make both of our packing fit into my suitcases, we would be able to get away with just one checked bag at $25! Lo and behold: it worked! Some of this due to the fact that I am a very light packer and have been known to wear everything I bring with no room for "well, maybe I'll find a chance to wear this. . ." I am all about layering. Plus, it will be on the cooler side in Italy so I have a feeling I'll be wearing my springtime trench most of the time. I also stock up on lightweight long sleeved tees which fold up to the size of almost nothing at all. These will come in handy in Egypt where a respectful dress code is required. Fitting everything into 2 suitcases is great - the idea of buying things on the trip and not having anywhere for them to fit is not so great. We are planning on flattening a smaller bag across the bottom of the larger suitcase to use as an extra carry on bag - after all, Bob will be allowed one more if he just sticks with a backpack on the way over (I will have my backpack - which I extolled about here - and the smaller of the two suitcases). One more thing to cross of the list! Breaking the news to Fredo that he's not able to come on our trip is still to come. . .
Every weekend I've been trying to find one area of the house to "get real" about: if I haven't touched it in the 2 years we lived here, chances are I'm not going to need it. Purging my possessions little by little. This past weekend I got inspired after a much overdue master bathroom cleaning. Check out the hot mess under my sink. Yikes, indeed. - I really am never going to learn how to use curlers. It's time to give up that dream. - Sunburn Relief ointment eventually expires. - That zebra print headband probably wasn't a good idea. Ahh, that's better. I considered ditching my little wicker basket, but it fits under here so perfectly. Who knows what uses we'll find for this little guy at the next place. Endeth the Purge. Until the next round. What will it be? The kitchen cabinets? The guest bathroom linen closet? What about under our bed. Not sure what is going on down there. . . Welcome to a time-honored tradition. Back in college, my friend Kari and I invented "Day of Fun and Culture." We would request off the same day from our summer job and start a full day filled with art exhibits, farmers' markets, ethnic food and a foreign movie to cap off the night. It was a great opportunity to explore different restaurants and check out the museums that we would walk by a hundred times. A few years ago, I held a Chicago Day of Fun of Culture - full of tourist essentials: a morning at the Shedd Aquarium, lunch at Giordano's, a show at Second City. The Sky Deck at the Sears Tower was on the list but unfortunately it was too windy that day and was closed to the public. A tiring day, but great to get out and about in this city I don't always take full advantage of. Kari came down a couple weekends ago to have a long past due DoFaC. I took advantage of the Chicago Public Library's Museum Pass program and picked up a pass to the Museum of Contempory Art. Up to 2 adults and 2 children can get in to various museums on one little pass that you can keep for a week - provided you have a library card of course. - Bank of America "Museums on Us"
Our timing in arriving at the museum was well-timed with the start of a performance by the Luna Negra Dance Theater - in and amongst one of the exhibits. Definitely a museum full of art that makes you think. . .some of it makes you think it's probably time to head home, but there are some interesting pieces here and there. Post-museum, we made our way to a matinee of future Academy Award winner "The King's Speech." A packed theater: everyone trying to get their Oscar on just in the nick of time. A busy day made staying in for the evening very appealing - a delivery order of great Chicago pizza and some mindless fun of watching Due Date later, and our Day of Fun and Culture came to a close! I encourage you to create your own Day of Fun and Culture - be sure to take into account how much time driving or taking public transportation from place to place can take. Take it from experience, this can definitely take a toll on your itinerary for the day. . .
Last weekend I found myself in the middle of another purge session: if we are going to move later this year I want to go minimalist, if I haven't looked at it for the 2 years we've been in this apartment, get rid of it! During the closet clean up, I found an extra IKEA magazine holder (The Kassat: $3.99 for a 2 pack) and decided to add it to the bookshelves - needed as Bob's Dwell collection grows and my brand new Martha Stewart Living subscription adds to the magazine horde. In doing so, I realized the handwritten labels I had in the filers weren't cutting it. I've said it before and I'll say it again: I have horrible handwriting! So I broke out the alphabet stamps and in a matter of minutes cleaned up the situation. The names may be a little misleading as you'll find a random Real Simple or Elle Decor in the Martha filer, but once those collections grow I'm sure they will get their own home! I'm on a roll! After creating two mini-canvas creations a couple weeks ago, I got productive once again and finished the job. I now have a quadrant of horizontal canvases ready to display in the home theater area. . . Although "Gone with the Apes" is my favorite, this one that combines some ominous Star Wars baddies looking on to poor Hanks and crew is a close second. This one used an image from Apollo 13and a wide shot of the Death Star printed out from my home computer on glossy photo paper, a Darth Vader postcard, a sticker from a Michael's purchased "planets" collection and, of course, a magnetic movie quote. Here's the foursome all together. Check out the first post for more detail on how these were created.